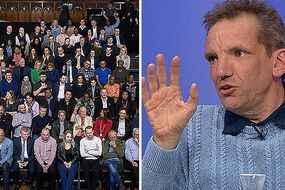 A furious Question Time audience member ripped into MPs on the BBC panel insisting all parties had “betrayed” Britons Brexit vote. The audience member pointed out Theresa May’s commitment to leaving the EU on March 29, amid fears of a delay, and Jeremy Corbyn’s manifesto pledge to deliver Brexit, with the party moving towards backing People’s Vote. The audience member said: “I actually think all three parties have betrayed every single one of us. “Theresa May, 52 times, said we will leave on March 29, she is now extending. Well probably will. “Corbyn said we won’t have a second referendum, now he is going to entertain that. “Liberals, Nick Clegg said there won’t be a European army. Cabin crew on @easyJet use a secret code during flights - have you spotted it?